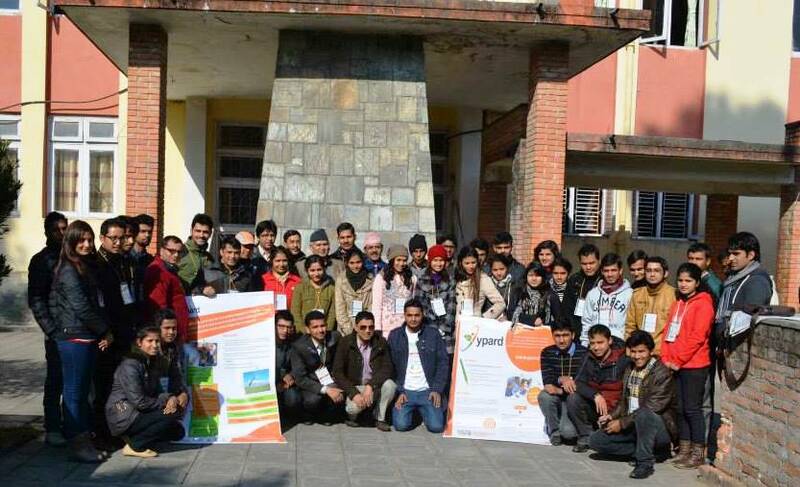 YPARD Nepal, in support of Multifarious Consultancy and Research Centre (MCRC) and National Federation of Youth NGO Nepal (NYFN), organized the National Youth Forum on Agro-based Entrepreneurship Development (#NYFAED15), on the 9th -10th of January, 2015 at the Local Development Training Academy in Lalitpur, Nepal. Generate conceptual tools needed for wider engagement and youth’s contribution in agricultural development. Day one kicked off with a fascinating overview of YPARD Nepal and the Objectives of #NYFAED15 presented by Dinesh Panday, YPARD Nepal representative. Mr. Panday included a welcome message from Ms. Courtney Paisley, YPARD Global Director, where she mentioned how young people expose to new and alternative ways of engaging in agriculture which can change as new opportunities become evident in the sector. Likewise, there were key notes from Mrs. Bimala Rai Paudel (National Planning Commission), Mr. Ishwori Rijal (Agriculture Information and Communication Center), Mr. Khem Raj Dahal (Institute of Agriculture and Animal Science), and Dr. Rajendra Devkota (agri-scientist). The opening session was hosted by Ms. Swikriti Pandey and Mr. Kamal Subedi (NYFN), who served as session chairs. The Winners from YPARD Nepal Family Farming Photo Contest were also awarded with cash prizes and certificates during NYFAED15. Then, the forum was leaded with technical sessions including three different presentations on youth and entrepreneurship, panel discussions with young farmers, agro-entrepreneur, ICT in agriculture and microfinance, as well as a think tank session to identify thematic areas of agro-based entrepreneurship development, which was facilitated by Mr. Krishna Pd. Tiwari. The second day was covered with a field excursion to Dr. Kedar Budhatholi’s Dahachowk plastic tunnel house for tomato cultivation, presentations, thematic group exercises, group presentations, draft preparation and closing ceremony. We selected 40 participants based on the quality of the online application, considering the need for a scientific, geographical and gender balance from the 152 applicants. During the first day, five groups formed by eight members/ each worked on thematic areas after defining prioritized lists on agro-entrepreneurship development. The group I was with started to work on agro-tourism, whereas groups II, III, IV and V on marketing, production, input preparation & supply, and processing respectively. The next day, the rest of participants had the chance to comment and suggest changes on the five groups’ work in order to make their projects more inclusive and realistic. We rounded off the workshop by identifying six different agro-based entrepreneurship problems and developing national level youth network to tackle in these issues. Those problems were: i) access to finance, ii) suitable government policy, iii) attraction to agriculture/ dignity, iv) access to technical information, v) protection to investors and vi) expansion services. Building the Nepalese Youth Network of Agro-Entrepreneurs! In order to improve YPARD Nepal’s work and make it more effective when dealing with agro-based entrepreneurship development, we developed an active group as national youth network of agro-entrepreneurs. Mr. Kshitiz Dhakal will work as Communication coordinator of the forty members that will form the group. The network will start to work on cluster level by forming regional forums to continue post workshop activities including researchers, extension workers, finance officers, and agro-entrepreneurs to make it more farmer-friendly. The forum agreed on conducting a mentorship program on transfer of technical information to the grass-roots levels for resource poor young farmers within the next six months, among other future needs. It was an amazing milestone in YPARD Nepal history to advance this movement which opened up some interesting discussions and differing points of view. These exercises will certainly provide a useful starting point to expand emerging practices through sustainable intensification and creative marketing. Moreover, they will inspire more young professionals to choose agriculture as a professional career to replace retiring farmers within the Nepalese context. We thank Bivek Mahat, Event coordinator, YPARD Nepal members, MCRC, NYFN, facilitator, invited speakers, AgriYouthNepal (AYN) volunteers, Ujyaalo Network and other personals who helped us directly and indirectly to make it successful. Click here to check all the pictures of #NYFAED15 out!